Living among old clothes and plastics - givekidsadreams Webseite! "The visitors are on the bus on the way back to Tây Ninh. We thank you very much. If you have scholarships to be awarded, please do not forget the poor students in Tân Châu!" After long consideration, we decided to accept further applications for the new school year. On November 2018, the 23rd, Mrs. Ninh Hong and Mrs. Ngoc Anh visited the families of three students from the secondary school Võ Thành Trang in Tân Phú. Thanh is 13 years old. Her parents split up and left their 3 children at the grandmother, who sells lottery tickets on the street to feed them. She gets vegetables, sometimes fish, when the market closes, and shops have to throw away their spoiled goods anyway. Thanh was born with constricted bronchial tubes. She received emergency surgery in 2016 and needs a yearly check-up, which costs about 500.000 to 700.000 VND (about 20-27 Euros). The rented flat smelled of musty rags. Thanh gets a little money from the trash dealer for the collected old clothes, plastics, bottles, etc. Her place for studying and sleeping is the top floor of the high bed, which makes it impossible to sit upright. Despite her difficult life circumstances and illness, Thanh looks very confident, has a beaming facial expression, answered the questions clearly and precisely. 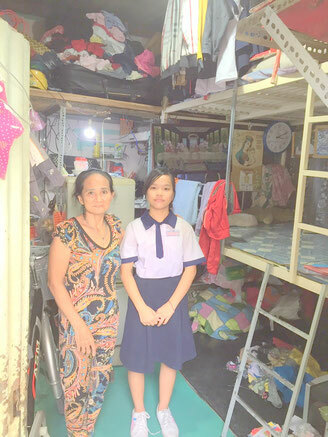 Her 8-year-old sister attends Tô Vĩnh Diện Elementary School and also has the strong will to be good at school to be able to look after herself and her siblings later on. Mẫn's parents are divorced, the younger brother lives with the mother. 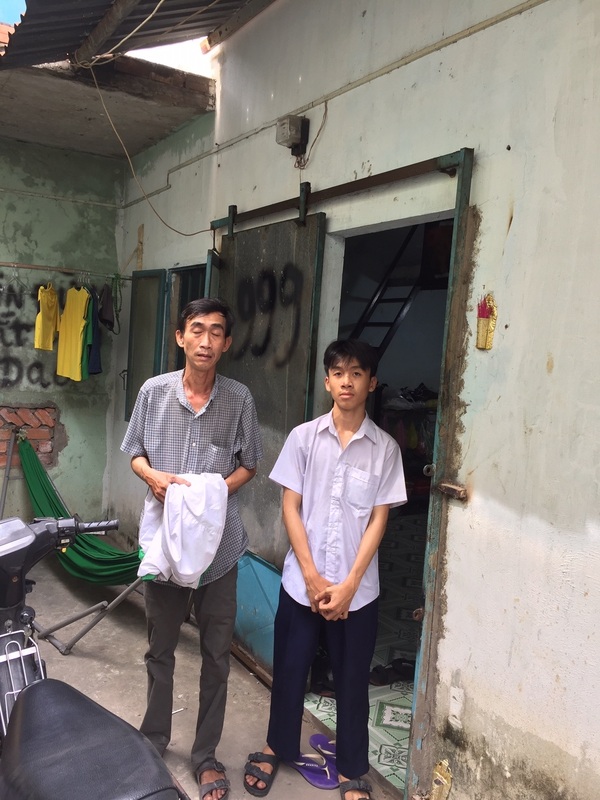 Mẫn and his father live in a small rented flat. 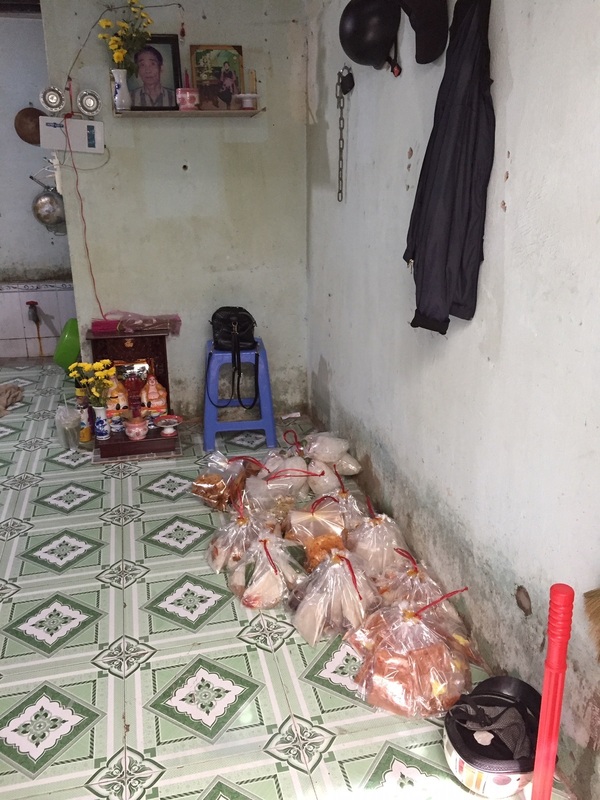 When they went to their home village to bury the deceased grandmother, the landlord threw away their belongings and Mẫn's school supplies as they had been away for too long. The father prepares and delivers small snack bags, a mixture of rice paper, mango, peanuts and herbs, to street vendors. 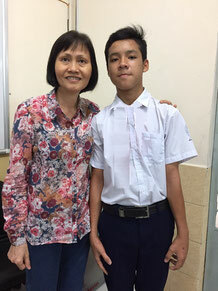 Since the beginning of this year, he cannot afford the school fees for Mẫn, and because of the circumstances Mẫn got the uniform and books from the school for free. Mẫn wanted to quit school because he did not want to be a burden to his father. After much deliberation, his father encouraged him, despite late registration, to continue to go to school. Mẫn looks a little reserved, is average in school. 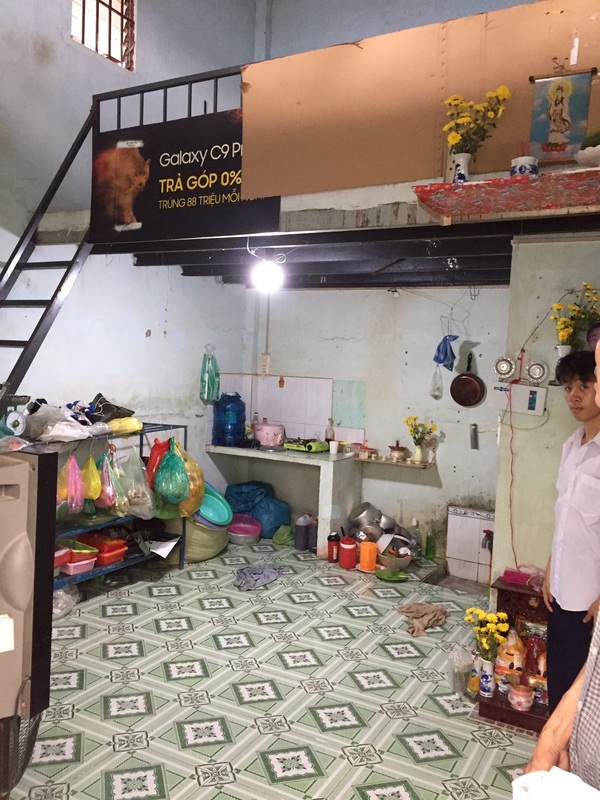 When Mrs Ninh Hong asked him what he wanted to become later, he cautiously stated that he wanted to do some craftsmanship, such as becoming an electrician. We think that attending a vocational school specializing in electronics after completing the 9th grade would be the right thing for him. GiKaD will accompany Mẫn in his professional orientation. Mẫn and his father at the flat, on the floor lay self-packed snack bags for street vending. Phong is from Phú Yên in central Vietam. His father is 64 years old and has a heart disease. His mother died in 2016 after a stroke. Since the father has taken a loan of 50 million VND (about 1.900 Euros) for the treatment of his sick wife, he had to move around in various cities after her death and work hard to repay the debt. Phong stayed in Phú Yên and had to take care of himself. Since February 2018 the father works as a janitor in a warehouse in Saigon and was able to bring his son to him. They spend the night in the warehouse, between the freights. Phong works from 7 a.m. to 11 a.m. as a packer, the bags weigh 25kg each. In the afternoon he goes to school. He can only study and do homework after 8 p.m. when the last worker leaves the warehouse. Since Phong had to take care of himself for a long time, his academic achievement also suffered. Although he does not have good grades, we explained that he can also receive a scholarship if he is willing to perform well. Thanh, Mẫn and Phong are children who live in the metropolis of Saigon between rags, plastic and trash or are forced to study in warehouses. But they don’t give up their dream of being able to escape from poverty through education. Thanh and Phong have already found their sponsors. We are still looking for sponsors for Mẫn and Trần Ngọc Thiện Tâm. Please help these children escape poverty through education!